Is an Electric Dog Fence Right for Your Yard? Keeping our dogs safe is our first priority as owners - after all, they’re members of the family. If your dog has ever escaped from your yard, you know the terror that ensues as you try to find them, hoping they haven’t wandered into the road. For most dogs, it’s necessary to have something that will prevent them from leaving your property. You have a big decision to make, however, in choosing between a traditional fence or an electric dog fence. How do you know which type is right for you, your yard, and most importantly, your dog? 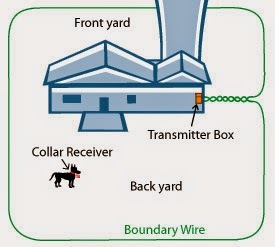 The vast majority of dogs are able to wear an e-collar and use the wired fence. In fact, some dogs do better with an invisible dog fence. Digging dogs, like terriers, and hunting dogs, like hounds, are particularly suited for an electric fence, simply because a traditional fence is often not enough to keep them contained. With an electric fence, your dog cannot dig under, jump over, or go through the boundaries. If your dog is prone to finding a way through your fence no matter what, a wired fence might be the solution you need. If your dog is under six months old, pregnant, or infirm, they should not be trained on an electric dog fence. You must also consider how aggressive your dog is. If you have a very aggressive dog, they could ignore the mild static correction of their e-collar when their adrenaline is very high. For dogs like this, it may be necessary to use both an electronic and a traditional fence for extra protection of both your dog and any passing people or animals. Another consideration applies to farm dogs where you run the risk of liability for personal property should your dog decide to attack your neighbor’s livestock such as chickens or goats. What Type of Yard Do You Have? The area you want to enclose will also impact your decision. An electronic dog fence is very versatile because it can be installed just about anywhere. Traditional fences require your ground to be relatively leveled out, but electric fences don’t require much preparation of the land. If your property is in an odd shape, a traditional fence may be difficult to place. Wired dog fences can be fit to any shape yard, even circular. The boundaries are totally customizable. If you have a very large property, such as a farm or ranch, an electric fence may be easier - and much less expensive - than a traditional fence. One wireless dog fence can enclose many acres of land at a time. Another situation in which an electronic dog fence might make a better choice is when you want to preserve the landscape or appearance of your property. A wireless dog fence will not change the look of your yard or block a great view. It also gives you unfettered access to the areas beyond your dog’s safe zone - without having to unlock and open gates to get through. Another consideration you must make before deciding on a fence is how much you’re willing to spend. If you have a modest budget, a quality traditional fence might be out of your price range. Fences, especially wood, can cost thousands of dollars. An electric fence for dogs, on the other hand, can cost as little as $300. If you’re willing to spend a weekend installing your electric fence on your own, you can save hundreds of dollars on installation fees. You should also consider maintenance over the years. Once an underground dog fence is installed, it is relatively safe from the elements and less prone to problems. A traditional fence can be damaged in a variety of ways, such as in a storm or from a falling tree, and it can be expensive to fix. Repairing or replacing a traditional fence is much costlier than doing your own electric fence repairs. If you live in a tornado or high-wind prone area you probably know how complicated it is to get your wood fence up after a storm. Sometimes contractors can take up to 90 days before your fence is back leaving your dog vulnerable should they decide to escape. Are You Willing to Train Your Dog? Finally, make sure you thoroughly understand what it takes to train your dog on an electric fence before you choose one. Read and understand the instructions, because you must use proper procedure for it to be effective. It takes a little as 15 minutes once or twice a day for two weeks before your dog will be fully trained on the fence. If you’re unable or unwilling to dedicate that time to training, then an electric dog fence is not right for you. Keep in mind that most fences have at a minimum two settings one warning and one correction. Many also offer a variety of levels allowing you to adjust it according to the size, breed and responsiveness of your dog. Published in partnership with www.dogfencediy.com We encourage you to share your experiences with a variety of dog fences in the comments section. We also encourage questions to help you understand if this type of dog fence is for you. Commenters and those who share the post in social media qualify for a drawing of a $50 Amazon gift card! Although we have not personally tried this fence, we know someone who has. They love it and it really works. Check out their user friendly website, there are reviews and a lot more information regarding the product. Our neighbour has an electric fence for his cows LOL. Our yard is almost 2 acres and we don't leave it... We DO have a Safe to Pee Fenced in area fur NIGHT time potty. Our yard is fully fenced but our neighbor uses an underground fence and it seems to work really well for their dog. We have a fenced yard but we're always supervised. We do know a dog who has an electric fence...it's very effective, but we have fences. Lady has a friend with an invisible fence and they love it . We had one of those, but it did not work for us Airedales. We did not mind getting "shocked" if there was a squirrel on the other side! We had an electric fence put in a long time ago and mom refused to use it because of the ducks and the duck poop! We use to have an e-fence but the Texas dirt is tough on the wire. Dad said before we can get a new put we have to redo the e-fence. If you live where there are predators (like mountain lions or coyotes), an "invisible" fence will not protect your dogs from them. An invisible fence does NOT keep other aggressive dogs or animals away from your pet. Your pet is trapped by not being able to get away from someone else's dangerous animal. A real fence will keep aggressive dogs and animals away from your pet. The most affordable and effective way to contain any dog on any property is to assemble a Pet Playgrounds dog fence. It has been specifically engineered to prevent dogs from escaping your property. In less than a day you can enclose an acre and save thousands with our DIY kit. Visit www.petplaygrounds.com/easyinstall to see just how easy it is to assemble. This fencing is durable and extreamly protective. Commercial Fencing Calgary also does fencing alike and other wonderful lucrative designs as well. They are the best for fencing.